Nursery Rhymes: not just for babies anymore! Some people think that nursery rhymes are just for little kids, but it’s absolutely not true! They are perfect for teaching reading. Nursery Rhymes are Fun for Students and Teachers! These fun poems help young readers practice basic foundational literacy skills and become better readers… plus, they’re silly and always make me smile. Of course, the kiddos like them too! When I first started teaching first grade I didn’t have a ton of books in my classroom library, but I could simply copy nursery rhymes and have them right at my fingertips. That’s how this resource was born. LOL. Our campus didn’t have any guided reading books. Can you imagine?? Nursery Rhymes saved me! I don’t know what I would have done without them. Free Books for Your Kids to Read at Home! Eventually, I created these mini books so I could print them for my classroom. Because they are only made out of copy paper, my students could also take them home and add them to their own home library. Nursery rhymes are a great resource for shared reading and guided reading groups. 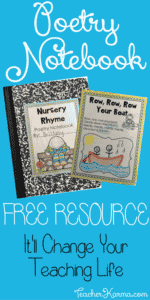 If you are looking to get started with nursery rhymes in your classroom, you will definitely want to check out my newest FREEBIE. Hey Diddle Diddle FREEBIE! Below you can check out an example of my Row, Row, Row Your Boat reader, so you can see that there three different versions of the reader. You will love the fact that you just have to fold on the dotted lines. No need to cut! Yea! Nursery Rhymes + Technology = FUN! Your FREEBIE also comes with an ebook. You can very simply add the ebook to your class iPad, display it on the classroom projector, or use it on a computer. To get your FREE Hey Diddle Diddle Reader Set, please click here, or on the graphic above. How have you used poems in your classroom to teach reading skills?